• Are you a passionate hockey fan looking to score some serious noise? 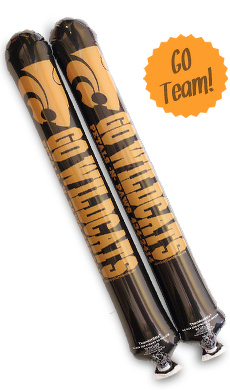 Purchase our hockey thunderstix noisemakers and you are certain to impress others and be the loudest fan at every game! • Imprint your favorite team's name and logo onto the personalized noisemakers, or simply imprint some artwork onto them. Free artwork design and proofing services available! • Designed 24" x 4.25" hockey custom thunder sticks and made with our high quality material. Sold in pairs of two. Imprint Area: 3.5" x 10"